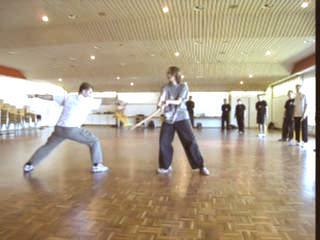 The sword can be deadly or merciful, depending on the intention of the swordsman. 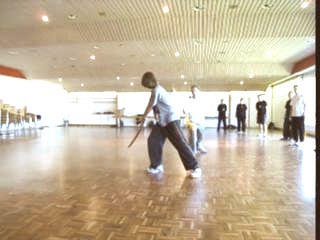 Both these aspects are shown in the combat applications worked out by the course participants themselves. Patterns like "Green Dragon Shoots Pearl" and "Golden Dragon Shoots Tongue" can kill an opponent in one move, whereas "Phoenix Dots Head" and "Point at Stars Look at Moon" merely disarm or disable an opponent from combat. But of course the final decision to be deadly or merciful lies with the swordsman, not the techniques. 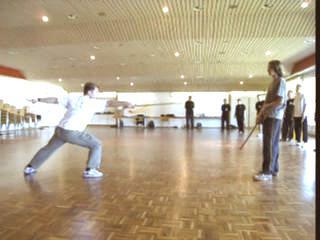 A merciful swordsman may just brush the skin of an opponents throat with "Green Dragon Shoots Pearl", whereas a drastic swordsman may cut of the head of an opponent with "Point at Stars Look at Moon". 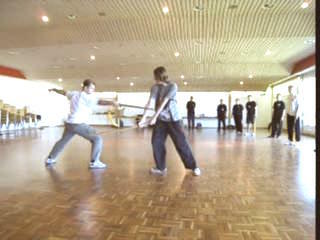 Deadly and Merciful Aspects of Swordsmanship from Wong Kiew Kit on Vimeo.